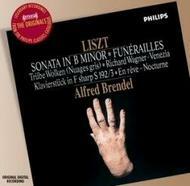 The Gramophone award-winning recording - Brendel plays Liszt's great sonata. Throughout his career, the great Austrian pianist Alfred Brendel has always been a champion of the music of the Hungarian composer and showman of the piano - Franz Liszt. Composed in 1853, the great Liszt B minor Sonata is regarded as a pinnacle of pianistic complexity and presents the kinds of technical and artistic challenges in which Brendel is shown to greatest advantage. What makes this classic recording even more remarkable is that the performance is presented with the warmth of the famous Philips piano sound, revealing every nuance of Brendel's breathtakingly virtuosic performance.